Note: This article was published in 1998, well before 5 x 5 style training had become as popular as it is today. Hard to believe, isn't it. But here was Bill Starr, preaching lifting truth in the bodybuilding literature of the day, just as he did throughout his entire adult life. Not many people realize that Bill Starr, apart from being a coach and trainer with an amazing depth of knowledge and experience, was also a highly skilled writer with an individual, recognizable voice and a pristine technique. Here below, notice the correct use of "quotes" and 'quotes' . . . the proper use of a colon before spoken words . . . the numbers from one to nine spelled out and 10 and over numbered in all non-training layout segments . . . as well as a few subtle uses of scene setting and change to make accessible and accentuate the internal occurring during narrative sections (e.g., "a cooling breeze rolled over us, making me feel much better" when it becomes clear the prodigal squatter has returned to the fold). He held to and maintained a high level of writing in all his articles, and I've yet to find one that was not interesting, informative and easy to understand. We as lifters really owe a great deal to this man. Thank You Bill Starr! It was one of those three-T-shirt days in the shed. Sweat ran off me in a steady stream, and I rushed to the open doorway after each set for a breath of air. I was trying to hurry through my routine since I had promised Gene that I would talk to him about his program. He wasn't due for another 15 minutes, so I slowed my pace, drank the rest of my water, and decided to skip my beach work (two or three higher rep sets for triceps and biceps). I was sitting on the grass with my back to the shed when he arrived. He laughed and observed: "You look wasted. Tad warm, isn't it?" I hadn't seen Gene in over a year. He had gone to Los Angeles to do graduate work at UCLA. It seemed to me that he had grown a few inches in height and he had certainly put on some bodyweight, especially in his upper body, but I quickly noticed that his legs were much too small for his large chest and shoulders. "It's like tempering steel," I returned. "Not for the weak of heart, that's for sure." I got up and we shook hands. "Nice tan. Makes you look out of place in Maryland." "You have to have a tan in California or pay a heavy fine," he replied with a chuckle. "Glad you noticed. Put on some weight, mostly here," he said, patting his chest. "But," he added meekly, "I know I need more lower-body work. That's why I wanted to talk to you." "What brought you to that conclusion?" I asked teasingly. He actually blushed. "I know, I deserve to be kidded, but I really didn't think I was letting my legs get that far behind until about two weeks ago. A bunch of us went to Venice Beach for the day. We were playing volleyball on the sand and I overheard a couple of girls talking about us. Naturally I figured they were impressed with our physiques because we all work out, but then I realized they were mocking us. I heard one say, 'They can't be athletes. They don't have any legs.' That really hit me. I played football for four years and always took pride in the fact that I looked like an athlete. I always hated that top-heavy look a lot of bodybuilders have, and now I end up in the same way." "How did you get so out of proportion?" "The gym I trained at was the main reason I guess. Everyone specialized on chest, arms and shoulders. I had never seriously trained like that so I decided to give it a try. We also hit out backs pretty hard, but no one did heavy squats. The most I ever saw anyone use was 315, and then he didn't go low. Besides, training the upper body is fun." I nodded. "This is typical of most gyms. Seldom do I ever see anyone even trying to squat more than 315 and, as you said, they don't bother going low. The reason most people have sorry leg development is that the exercises which bring the most results are difficult. Leg work, to be productive, is very hard work. Most of the modern-day trainees are looking for an easier route to greater size and strength with elaborate machines, scientifically formulated nutritional products or shortcut systems. But the bottom line remains: Tease the lower body and nothing happens, but attack those muscles and they will respond. "I remember starting with you right here in the shed. You got me doing full squats at the first workout, and I thought I would die. I was sore for four days, but I made gains in them right away. And they helped me a lot on the football field. They were also the main reason I put on 20 pounds that first year. I definitely know I need to get back to a hard lower-body program. That's why I came to see you. I'm more than willing to do the work. Just tell me what I should do." A cooling breeze rolled over us, making me feel much better. "First tell me what you've been doing for your legs." "I've been working them twice a week, but never really heavy. Squat one day and do leg presses on the other day. On both days I've been doing leg extensions, leg curls and calf raises on the machines. But in all honesty, I've just been going through the motions. They put a lot of emphasis on 'maintaining' out there." "Not just out there. Everywhere. Maintaining is another word for loafing. Your first step is to put heavy squats back into your program. By heavy, I mean you should be seeing the White Buffalo on the final few reps of your last set. Any less effort and you're back in the maintaining mode.' (seeing the "White Buffalo” - those spots, stars and sparkles you see when you've pushed yourself up to a high level of exertion). "I remember the White Buffalo. Haven't seen him in years. All right, I'm game. So squat heavy twice a week?" "Not exactly. Go back to squatting three days a week until you build a solid foundation. Then, if you want to squat only twice a week, that will be okay. Squat heavy on Monday, light on Wednesday and medium on Friday. Figure out your workload at the very beginning and slowly add to it. Once you've reached a fairly high level of strength on the squats, you can build in some variety, like front squats, lunges and leg presses. But just use full squats as your core leg exercise for two or three months." "No calf raises, leg extensions, leg curls?" "You can and should be doing these also, but they are auxiliary movements, not core exercises. 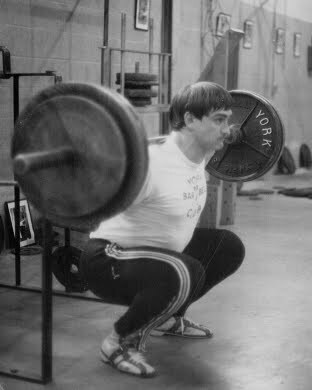 Concentrate all your energy into improving your squat and you will build a solid strength foundation. Working the squats hard is also the very best way to pack on muscular bodyweight. No other single exercise stimulates growth like the squat." "What about sets and reps? And how much weight should I use at first?" "You start from where you are now and work up. Tell me what you can full squat now and I'll outline the numbers for each workout." "I'm pretty sure I can do 315 for 5 right now." "So that will be your top-end set for your first heavy day, Monday. Do 135, 185, 225, 275 and 315 for 5." "That's right, because you can't get ahead of yourself, regardless of how motivated you are. You have to slowly establish the strength base. If you try to do too much too fast, you'll run into trouble. On Wednesday, light day, do 135, 185, 225, 245 and 265 for 5." He was writing the numbers down on a yellow pad. He chuckled and commented: "I thought you said this was a hard workout. This will be easy." "The light day was designed to be a relatively easy day. But it's a very important day, for it allows you to increase your total workload, without a great deal of stress and it also helps you perfect your technique. After a few months the light day will not be a walk in the park, but it will always be easier than the other two workouts. On Friday, medium day, you'll use a different set and rep sequence. Do 135, 185 and 225 for 5, then 275 and 325 for 3." "That's more than I used on Monday. Wouldn't that make it a heavy day too?" "No, because the heavy, light and medium concept is based on total workload and also on intensity. Your workload and intensity are both higher on Mondays. On Mondays and Fridays, do 2 sets of 20 on the leg curl, leg extension and adductor machines. Also do calf raises, 3 x 30. That's you leg workout." "That doesn't sound like very much," he mumbled. "It's plenty, believe me, because you're going to be constantly pushing those top-end numbers on Monday and Friday. Your second week will have you doing your final set of 5 with 325, the same amount you used for your last set of 3 on Friday. The second Friday will have you handling 335 for 3. You'll continue like this for eight or 10 weeks or until you hit a sticking point. If you're eating lots and packing on weight, you'll be able to add 100 pounds to your squat in that time." "But very realistic. I've had athletes at John Hopkins who put 200 pounds on their squat in a matter of three months following this routine. One of the keys to progress is consistency. Miss a workout, even the light day, and you've disrupted the rhythm. Getting three sessions in a week is very important, even if you have to do two back to back. As you continue to increase the weight you use for your final set of 5 and 3, you will also be improving your total workload. This is necessary in order to establish a more solid foundation. I compare it to building a pyramid. Widen the base and the top end will take care of itself. Later on we'll look at steps to increase your workload, add variety once you're squatting heavier weights, identifying weak spots and a few more points. But for now, work hard on upping your squat numbers."